In the past, window and door replacement projects involved a lot of imagination. You had to picture the units in your mind to have an idea on how they would mesh with your existing home design. Fortunately, this is no longer the case. 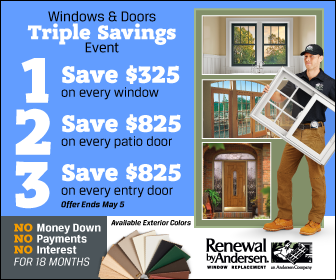 Renewal by Andersen® of St. Louis’s Window and Door Visualizer is your new best friend in home improvement. This h andy tool helps you push the envelope of window and patio door customization. It lets you explore the design possibilities we have the offer and allows you to see how your replacement units would look before construction begins. The fun begins by choosing the picture you want to play with. It could be an actual photo of your home or any of the default images available in the tool. We recommend editing more than one picture since the design of replacement windows and patio doors depend on the rooms they serve. In most cases, the bedroom dem ands units unique to it than those needed by the living room. Our Window and Door Visualizer will guide you toward customizing every detail you can change. It allows you to pick the configuration, frame, trim, grille type and style, glass, and hardware. With plenty of choices at your disposal, you’ll enjoy considerable latitude in designing your windows and patio doors. With just one click, our tool provides you a snapshot of the current elements that make up the unit you’re editing. The best benefit of this review feature is ensuring you haven’t missed anything. This way, you can customize your windows and doors to the fullest. Once you’re done, you’ll have the option to share your creations on Facebook or pin them on Pinterest. You can also save your designs in JPG format or print them, so you can easily show them to us during our initial visit to your home. Turn to the patio door and windows company that makes life easier for you. If you’re ready to share your ideas with Renewal by Andersen of St. Louis, call (314) 332-2364 today. We’ll be happy to schedule your FREE, in-home consultation in Chesterfield, MO, at your convenience and talk about your Missouri project.